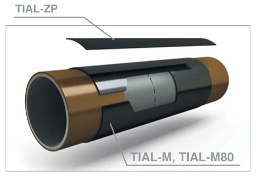 TIAL-M and TIAL-M80 are heat-shrinkable wraparound sleeves for corrosion protection of pipeline welded joints in conjunction with cathodic protection. The sleeves are elaborated for the easiest installation in field conditions. TIAL-M sleeve is specifically designed for pipelines with operation temperatures up to 60°C. TIAL-M80 sleeve is specifically designed for pipelines with operation temperatures up to 80°C. TIAL-M and TIAL-M80 sleeves are certified according EN 12068 standard, class C UV. The sleeves have two-layer structure (polyethylene backing and hot-melt adhesive). They can form three-layer corrosion protection system when used together with TIAL-P two component solvent free wet epoxy primer. The choice between two- or three-layer coating system depends on requirements of a project. TIAL-M or TIAL-M80 sleeves are fixed on the pipe surface with the help of TIAL-ZP closure patches. The closure patch is a non-shrinkable fiberglass reinforced polyolefin tape with adhesive layer which has high resistance to shear forces. The delivery set of either TIAL-M or TIAL-M80 sleeve includes one two-layer sleeve, one TIAL-ZP closure patch and one TIAL-P epoxy primer set. Components of the primer are packed in the amount sufficient to coat one field joint of specified diameter. TIAL-M or TIAL-M80 sleeves can be delivered in 30 running meter rolls. The rolls are cut to the required length by installation crew on site. Lifetime of TIAL-M sleeve is minimum 45 years. Note! 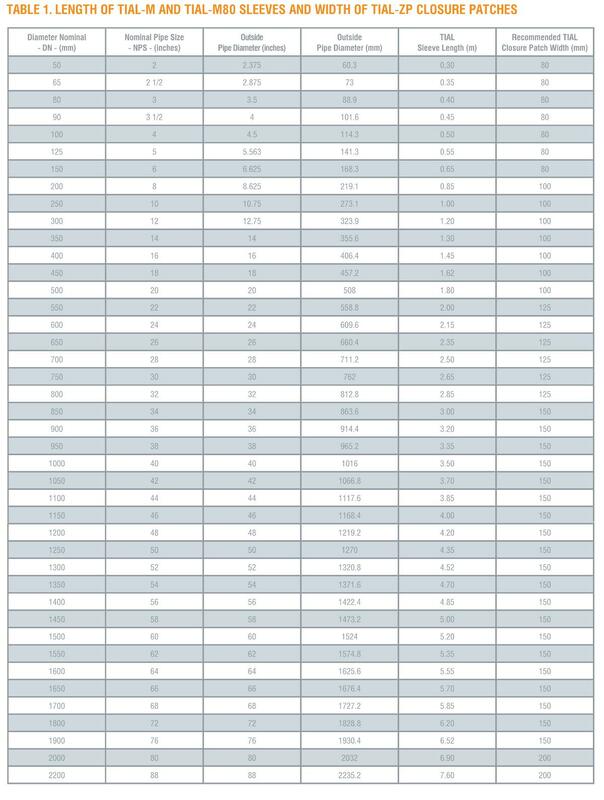 When pipe diameter in the order is stated in DN or NPS the sleeve length is calculated according to the exact outside pipe diameter listed in Table 1. К - sleeve ends overlap (110 mm for ≤20″ and 160 mm for ≥22″). Table 2 indicates TIAL-P wet epoxy primer weight corresponding to pipe diameter and sleeve width. This table is presented for information purposes. 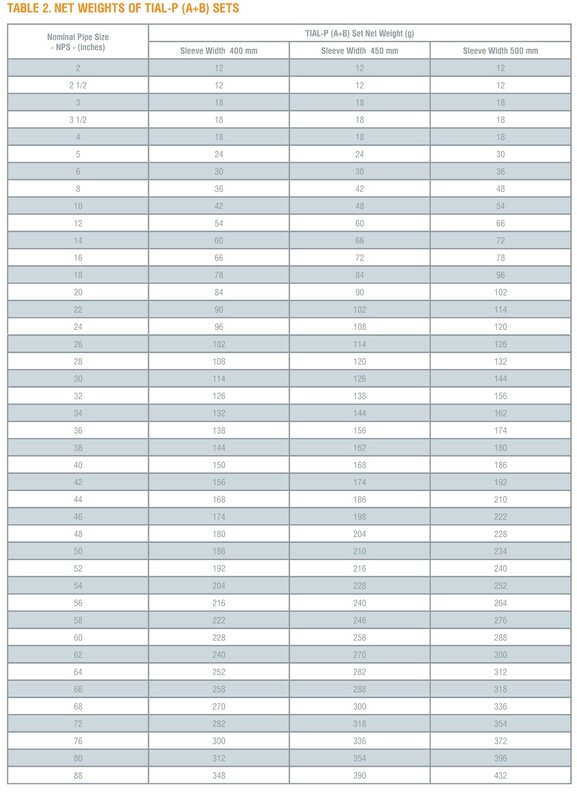 The primer is supplied in accordance with the table. Weights are calculated for most frequently applied sleeve width. In case width of sleeve is different from stated in the table please contact TIAL to obtain required primer weights. For the easiest installation TIAL-M and TIAL-M80 sleeves are supplied with primer application kits. diameter greater than or equal to 22″. In case of order 30 m rolls for more economical calculation it is recommended to state pipe diameter. One application kit is enough for 50 welded joints of a pipe with diameter of ≤20″ and two kits suffice for 50 welded joints of a pipe with diameter of ≥22″. * Standard width 80, 100, 125, 150 and 200 mm. Can be changed upon request.